LG has revamped its TV line up for 2014, with new models putting a focus on premium image quality and ease of use. There are three new product designations to look out for, which are the E Series, L Series and the U Series, with each one representing a different type of technology. The U Series of LG TVs is the one we'll start off with, mainly because it represents the company's flagship 4K (Ultra HD) products. Get one of these if you want to be one of the first on your block with the latest tech, but don't expect to be able to show it off easily in the beginning. Indeed, 4K content is currently thin on the ground, but LG claims that the new TVs can be used just as effectively to display Full HD content, thanks mainly to the type of upscaling technology that has been implemented. The upscaling differs depending on the size of the TV, but it is a multi-stage process that has a purpose of exposing fine details in less-than-4K content and making it look good on the larger screen. LG explained that with proper upscaling, you can sit closer to a TV and not notice a drop in quality, and said this is a good thing for users who want to install a big TV in a small living space. The panels use IPS (in-plane switching) technology, which means they have wide viewing angles, and the models that we observed at LG's Sydney launch showed excellent clarity and vibrant colours while playing timelapse content from a computer. The other big thing about these new TVs is their use of a new menu interface that is based on webOS -- yes, it's the same operating system that HP used on its tablets a couple of years ago. WebOS is designed to be as simple as possible to use on these TVs, mainly because LG's research has found that people so far do not make much use of smart TV functions due to the clunky nature of the interface environment. The new interface pops up a launcher from the bottom of the screen, which allows you to easily click on apps, inputs, and the LG Store, and the whole thing is customisable so that you can move your favourite things to the front for quicker access. Furthermore, multitasking is supported, meaning that you won't have to exit an app in order to enter another one. A live menu on the right side of the screen can be accessed to browse and change channels, and also to play recorded content, without the screen content being heavily impeded. A twin tuner is built in to these TVs so that you can watch one channel while recording another is being recorded in the background. There is an episode guide that makes use of the Gracenote database so that you can see detailed information about a program, including actors. The remote control is one of LG's Magic Remotes that can be used in a conventional manner, of by moving it around like a wand to move the cursor on the screen. It may seem silly to move the remote like a wand in order to change settings or access the webOS launcher, but it's intuitive, and it worked with good accuracy during our brief play with it at the Sydney launch event. LG claims that voice control can also be used to good effect. It's powered by Dragon and LG said that is has Australian English recognition built in. It can also be used as a universal remote. Here are the U Series models that are available, and their key specifications. 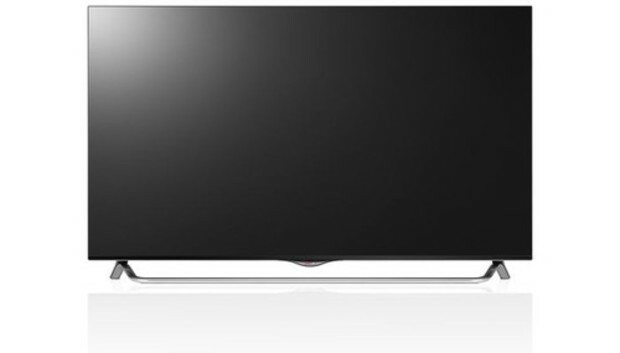 LG's L Series of TVs is available in a wider range of sizes compared to the other series, mainly because the TVs are standard LED-backlit panels with a Full HD resolution. This is mainstream product that you would go for if you're not an early adopter -- that is, you would pick up one of these if all you want is a regular smart TV with functions that will let you watch online services such as ABC iView and SBS OnDemand, and also to stream content from your local devices. There are two product lines in this series, with the LB6500 featuring screen sized from 32in to 55in, and the LB7500 doing the heavy lifting for for screen sizes from 55in to 65in. The difference between the two products lines can be seen physically, with the LB6500 featuring a stand with a leg either side of the screen, while the LB7500 features what LG calls its 'Cinema Screen Design', which has more of a base in order to support the larger screen sizes. Smart TV functionality is aided by the new webOS interface, and the Magic Remote is part of the package, too. Here are the key specifications for the available L Series models. The E Series is LG's OLED TV, which came out in 2013. You couls say it's the TV of choice for an early adopter who wants the absolute best in image quality and perhaps a new type of 'feel' when it comes to watching the TV. It has a curved panel that is said to provide a feeling of immersion when watching movies, and it's available in a 55in size. LG has said it is putting a lot of effort into the OLED space, primarily because it's a technology that can produce a much more impressive black level and overall contrast than LED-backlit TVs. Furthermore, OLED panels are also much quicker in their response time and can therefore produce better clarity for faster moving pictures. LG claims to have cracked the code for manufacturing OLED panels with high yield rates, and said that OLED technology is basically the future for TVs because it offers the best viewing experience. As such, LG will be launching a 77in, 4K, curved OLED TV by the end of 2014. The webOS interface is not present on the E Series, but it is a Smart TV that allows for content to be viewed via online services and through connected devices in the home. You also get the Magic Remote and its voice features. Here are the key specifications.